Industrial and domestic effluents, as well as indiscriminate application of pesticides/herbicides to crop fields, have contributed to the deterioration of environmental quality. Among these pollutants, radioactive elements (uranium) and heavy elements represent a special group because they are not chemically or biologically degraded in a natural manner. Nowadays, aiming to reduce waste residue generation in industrial and agricultural processes, as well as improving the reuse of these waste residue materials in the production process, companies are investing more in research that would help to transform them into commercially interesting byproducts, such as from agriculture waste like rice husk (RH). Rice is one of the most commonly grown and consumed grains in the world. It is considered to be the most economically important product in many developing countries, being a staple food for billions of people. During the processing of rice, the most voluminous byproduct is husk, which represents about 20% of the rice weight. RH is a light, bulky, porous, and fibrous material, composed mainly of cellulose, lignin, and inorganic and organic compounds. The use of RH in the sorption of metals from aqueous solution has been recently discussed due to its low cost, abundance, easy availability, and possibility of reuse.,, Studies on metal removal using different adsorbents, such as clays,, zeolites, sugarcane bagasse, and other materials, have been reported in the literature. In this context, the characterization of modified rice husk (MRH), as well as its potential use as a biosorptant for the removal of uranium ions from its raffinate solutions, has been studied. In batch equilibrium experiments, isotherm models were performed using standard solutions of the uranium ions. A case study was performed using the obtained optimum conditions; a feasibility study for the whole process was also performed. The RH obtained from a local farm near Shbien El-Qanater area, Qualiaya Governorate, Egypt had the chemical composition as shown in [Table 1]. RH of known weight (25 g) was treated first with NaOH (40 g/L) in a rounded flask and then placed on a mechanical shaker at 25°C for 2 h, and filtered and dried; after that, the treated husk was subjected to different concentrations of HCl and HNO3 acids to activate its surface and were referred by modified rice husk by hydrochloric acid (MRHC) and modified rice husk by nitric acid (MRHN), respectively. In this study, the used liquid waste sample was obtained from uranium purification unit (Inshass); the concentrations of uranium, iron, and calcium ions were 260 mg/L, 1.6 g/L, and 1 g/L, respectively. Synthetic standard uranium solutions (1000 mg/L) were prepared by dissolving a certain amount of uranyl acetate in distilled water, and required concentrations were achieved by dilution of the standard solution. The concentration of UO22+ ions in the solution was determined spectrophotometrically using a Lambada3 UV/VIS spectrophotometer (Perkin-Elmer, USA), in which arsenazo(III) was used as a complexing reagent at 650 nm against proper standard solutions using the method of Marczenko. where qe (mg/g) is the amount of the uranium adsorbed per unit mass of RH. C0 and Ce are the initial and equilibrium (or at any time) ion concentrations (mg/L), respectively, V is the volume (L) of solution, and M is the mass (g) of the MRH. RH contains nearly 83% organic matter, which is mostly cellulosic and lignin in nature [Table 1]. The presence of high amount of silica makes RH a valuable material in the industrial applications. The husk used had an irregular surface, as shown by scanning electron microscopy (SEM) [Figure 1]a and [Figure 2]a, whereas after activation with HCl and HNO3, the surface changed and holes and cracks were formed on the surface [[Figure 1]b and [Figure 2]b. The holes and cracks were caused by the dehydrating action of the activating agent, which leads to porosity development; in addition, the surface area of MRHC and MRHN determined by brum auer emmnet and tellrt (BET) method was 0.98 and 1.12 m2/g, respectively. Fourier transform infra red (FTIR) spectra of MRHC and MRHN showed some typical adsorption bands as seen in [Figure 3]. The FTIR spectrum of MRH was characterized by the following adsorption bands: sharp band at 3450 cm−1 that mostly arose from the OH group, which was found at both treatments, whereas the band around 2900 cm−1 was back to the asymmetric C–H stretch of the methyl group, and also the band near 2350 cm−1 referred to asymmetric stretching vibrations of species M–O–CO. The bands present at 1654 and 1637 cm−1 were back to conjugated ketons, and bands present at 1369.7 and 897 cm−1 referred to CH3 and CH deformation. The nitro group (N–O) bands were located at 1507 and 1385 cm−1 and at 1158 cm−1 that refers to the amide group, which was considered the characteristic band for MRHN and was responsible for uranium adsorption. The indicative band at 597 cm−1 was back to C–Cl, which was responsible for uranium adsorption in MRHC. The study of contact time is important because equilibrium time is one of the parameters for economical wastewater treatment plant. The effect of contact time on uranium absorption efficiency percent was studied using a fixed mass of MRHN or MRHC (0.25 g) at 25°C with uranium concentration of 100 mg/L. The applied contact time ranged from ½ to 6 h. The plotted results in [Figure 4] show that with contact time increase, the uranium adsorption efficiency increases and the maximum adsorption occurs after 2 h; thereafter, a slight increase in the absorption efficiency occurs with increase in the time to 3 h, at which time equilibrium occurs. By comparing the obtained results in the case of MRHN and MRHC, it is quite clear that nearly the same phenomena occurred, and equilibrium between the metal ions and those adsorbed on the MRHC sample was attained at about 120 min, which was set as the optimum time for the rest of the experiments. The adsorption behavior shows that at the starting stage adsorption takes place in a fast manner on the external surface of the adsorbent followed by a slower process. The trend in uranium adsorption gives an indication that the binding may have occurred due to conjugation with functional groups located on the surface of the MRHN or MRHC. These results agree with Li et al., who found that 120 min as contact time is efficient for lead adsorption on the surface of tobacco, and also stated that at a fixed adsorbent dosage and at lower concentrations, the ratio of the number of metal ions to the available adsorption sites is low and subsequently the fractional adsorption becomes independent of initial concentration. At higher concentrations, the available sites of adsorption become fewer and subsequently the removal of metals depends on the initial concentrations. Guibal et al. stated that adsorption kinetics are generally planned by different mechanisms, including the initial curved fraction or boundary layer diffusion and surface adsorption, and the linear fraction, a slow adsorption stage due to the intraparticle diffusion, followed by a plateau to the equilibrium wherein the intraparticle diffusion starts to decrease due to the low concentration in solution phase, as well as fewer available adsorption sites. In this study, the applicability of pseudo first- and second-order models will be tested for the adsorption of uranium on MRHN or MRHC. where qt and qe are the amount of uranium adsorbed (mg/g) at time t and at equilibrium, respectively and kad is the rate constant of the pseudo first-order adsorption process (min−1). The slopes and intercepts of plots of log (qe−qt) versus t were used to determine the first-order rate constant kad and equilibrium adsorption density qe. The obtained correlation coefficients for the pseudo first-order kinetic model at the inspected concentrations are low [Table 2]. In addition, the theoretical qe values calculated from the pseudo first-order kinetic model do not give reasonable values [Figure 5]. This suggests that this adsorption system cannot be confirmed by pseudo first-order reaction. Because the adsorption of uranium is not confirmed by pseudo first-order reaction, the pseudo second-order will be tested using the equation reported by Ho and McKay. where h = kqe2 (mg g−1 min−1) is the initial starting adsorption rate as t → 0, and k is the rate constant of pseudo second-order adsorption (g mg−1 min−1). qe, k, and h can be determined from the slope and intercept of straight line results from the plot t/qt versus t. The correlation coefficient for the second-order kinetic model acquired is greater than 0.998 for both concentrations [Table 2]. The calculated qe values also match well with the experimental data. These results imply that the studied adsorption system belongs to the pseudo second-order kinetic model [Figure 6]. A similar finding is also observed in the adsorption of copper onto cedar sawdust. The verification of pseudo second-order kinetics mark that in the adsorption process, concentrations of both adsorbate and adsorbent are involved in rate-determining step, which may be a chemical adsorption or chemosorption and physiosorption. 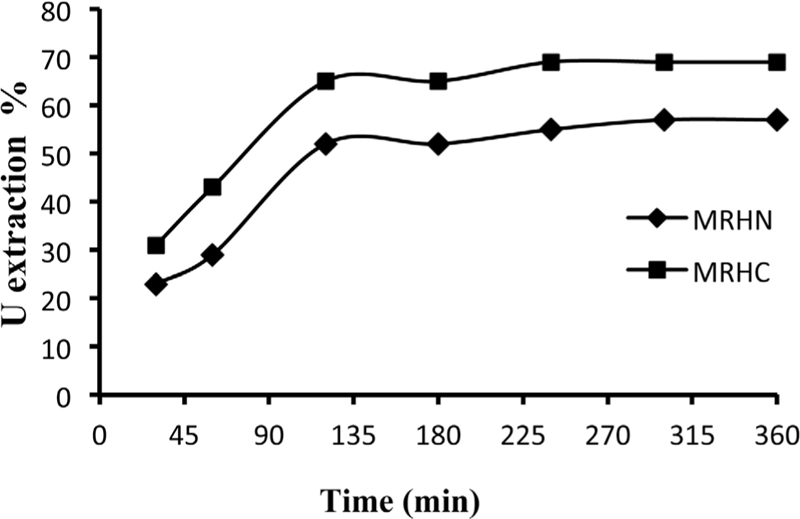 Effect of initial uranium concentration on the adsorption efficiency was studied using a fixed mass of MRHN or MRHC (0.25 g) at 25°C and contact time 2 h. The working uranium concentrations range from 100 to 500 mg/L. 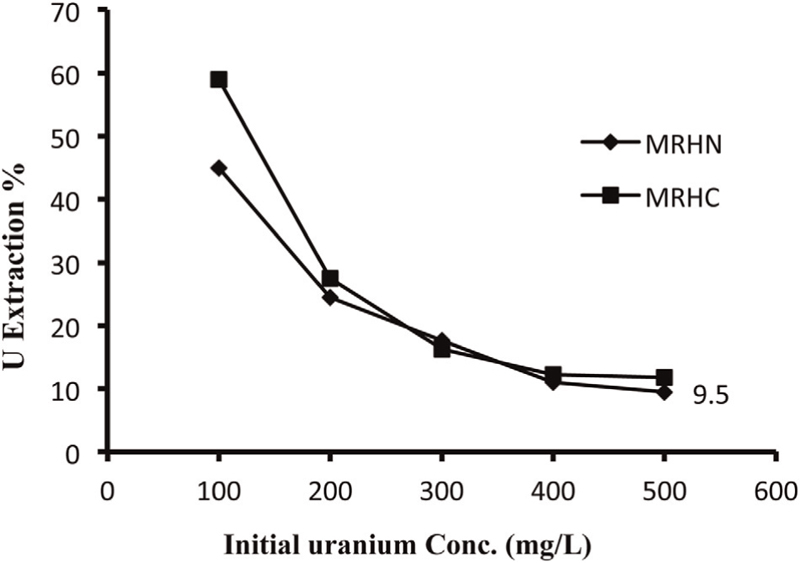 From the obtained results [Figure 7], it is clear that with the increase in the uranium concentration, the adsorption efficiency decreases, and the highest efficiency occurred at uranium concentration of 100 mg/L for both MRHN and MRHC. This is attributed to higher mobility of uranyl ions (UO22+) in the diluted solutions; the interaction of the ions with the adsorbent increases, whereas with increasing uranium concentration over 100 mg/L, competing effect of uranium ions increases on the free active sites, which lead to a negative effect on the adsorption efficiency. Therefore, 100 mg/L uranium ions concentration is selected as an optimum concentration. It is also clear that the MRHC adsorb uranium ions more than MRSN, and this may be due to the structure of the natural RH in which Cl− group is more efficient to uranium adsorption than NO3− when the uranium ions are present solely in the solutions. Effect of temperature on uranium adsorption efficiency was studied at different temperatures ranging from 20 to 70°C. 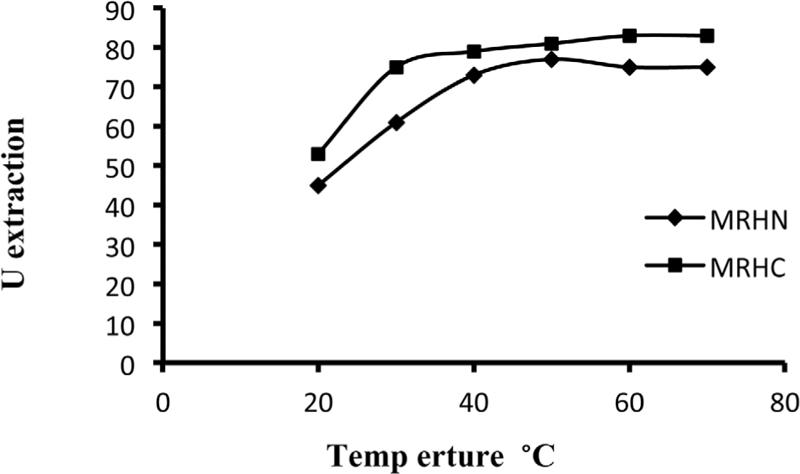 Results plotted in [Figure 8] indicate that adsorption efficiency of uranium increases with the increase in temperature from 20 to 40°C; then, a slight increase is observed, which indicates that the adsorption is an endothermic process. From an economical point of view 40°C was set as the temperature for the rest of the experiments. The pH of aqueous solutions rules the solution chemistry of the heavy metals (i.e., hydrolysis, complexation, redox reactions, and precipitation), and the solution chemistry of the heavy metals strongly commands the speciation and the adsorption availability of the heavy metals; the linking of metal ions by surface functional groups is strongly pH dependent. 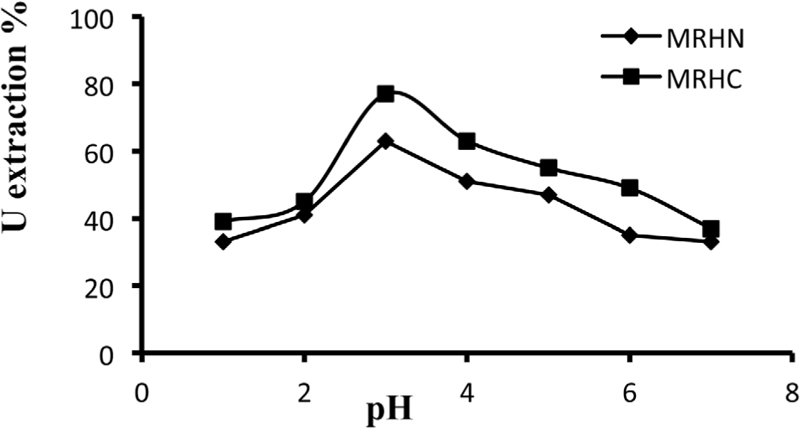 Effect of the initial pH on uranium adsorption by the MRH (MRHN or MRHC) is illustrated in [Figure 9] showing that the adsorption capacity of the MRH increases with the increase of pH value, reaching its maximum at pH 3 and then decreasing with further increase in pH. At low pH (below 3), there is exaggerated protonation of the active sites at MRH surface and this often turns down the formation of links between UO22+ ions and the active site. At pH value 3, linked H+ is emitted from the active sites and adsorbed amount of metal ions is generally found to increase. A similar interpretation has been reported by several researchers for metal sorption on different sorbents., At higher pH values (above 3), aqueous metal hydroxide formation may become a considerably used mechanism in the metal removal process. These results are in agreement with Kumar and Gayathri, as they stated that pH plays an important role in Pb+2 adsorption onto the ale tree leaf powder. Effect of solid liquid ratio on uranium adsorption was studied under the following conditions: 100 mg/L uranium concentration, 40°C, pH 3, and 2 h as contact time; the solid/liquid ratio was performed at fixed MRH weight of 0.25 g. and aqueous volume varied from 10 to 60 mL. The plotted results in [Figure 10] reveal that uranium adsorption efficiency increases steadily with the MRH mass and then tends to decrease with further increase in the mass weight. This is probably because the free sites on the adsorbent have been filled by the uranium ions at 0.25 g/40 mL S/L ratio and subsequent increase in the volume does not affect the adsorption capacity. It is also clear that both types of modification act the same, and from an economical point of view, a ratio of 0.25 g mass weight/40 mL aqueous volume is selected as an optimum solid/liquid ratio. According to Li et al., the adsorption capacities variation may be dependent on the type of surface group accountable for the sorption of metal ions from solution. In addition, they found that with the increase in the adsorbent dosage, high surface area becomes abundant, resulting in an increase in active sites on the adsorbent and facilitating the adsorption of metal ions. where Qmax represents the maximum monolayer adsorption capacity (mg/g), and b is the affinity constant (L/mg) associated with the energy of adsorption. The adsorption constants (Qmax and b) are obtained by plotting Ce/Qe as a function of Ce, as well as by further linear regression analysis [Figure 11]. where Kf represents the Freundlich constant (mg/g) related to the adsorption capacity of adsorption and n is the Freundlich exponent associated with the adsorption intensity (dimensionless). The value of n and Kf for Freundlich adsorption can be obtained by plotting ln Qe as a function of ln Ce, as well as by further linear regression analysis [Figure 12]. From the obtained calculated results in [Table 3], it can be observed that Langmuir isotherm is able to describe the adsorption process more than Freundlich with correlation coefficient (R2) equal to 0.99 in both treatments, and the qmax is about 13.2 and 11.46 in MRHC and MRHN, respectively. A case study on the obtained experimental results was fulfilled using 1 L from waste liquid solution having uranium concentration of about 260 mg/L. Before performing the case study, the uranium bearing solution was diluted to 2 L using distilled water to reduce the concentration of iron ions to make the adsorption more feasible. The fixed conditions of the experiment are as follow: initial uranium concentration 130 mg/L, pH 3, temperature 40°C, S/L ratio 0.25 g/40 mL, and 120 min as contact time. After equilibration, the study solution was filtered and analyzed for uranium concentration, and it was found that about 80 mg/L uranium was adsorbed on the MRHN while in MRHC only 50 mg/L was adsorbed reflecting adsorption efficiency of 61.3 and 38.6%, respectively. 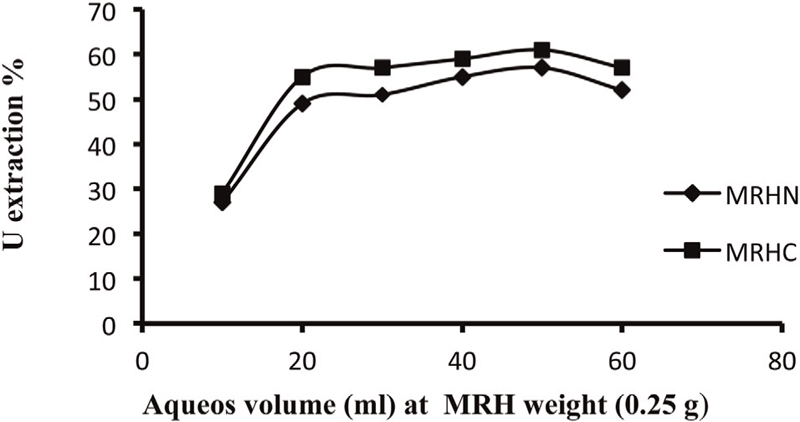 Results revealed that RH modified with HNO3 is more effective in the removal of uranium. Adsorbed uranium was desorbed by 25 mL of 0.1 M H2SO4, wherein 98% of the adsorbed uranium was eluted from both modified rice husks. Economic study always expresses the ratio between the input and output of any production process by converting the financial values into economic values and by adding or removing any income or financial returns that are not economic. Production cost means the payment values spent for the production items needed to produce a certain product, during a certain period. This includes wages, salaries, used raw materials’ values (RH), chemicals, measuring instruments, and interest of the loaned capital funds. The estimated costs include consuming of tools and buildings, and hiring value of the land hired to the project owner. The production costs can essentially be divided into two sections: fixed and variable costs. The total cost of both fixed and variable costs of the uranium extraction unit using mineral acids (HNO3, HCl) is tabulated in [Table 4]. Different tools were used for measuring the production efficiency; the scale of benefit/cost ratio, which is defined as the ratio between the production values to the cost of production elements used in the production process, is one of these tools. This scale is used as a measure for the production efficiency based on the common international price of 1 kg of uranium during 2013 to 2014 which is about 85$ = 700 LE. From the tabulated results [Table 5], it is clear that the benefit/cost ratio results are 0.037 and 0.023 for MRHN and MRHC, respectively and both are under the value of 1, which declares that the result is negative and the cost is more than the benefits. Invested capital measure gives a sense of how well a company is using its money to generate returns. Comparing a company’s return on capital (ROIC) with its cost of capital (WACC) reveals whether invested capital has been used effectively. It is clear from [Table 5] that the average of interest of the invested capital fund took a negative value in both HNO3 and HCl treatments (−99.96 and −99.97) as this project is one of the strategic projects, and it is not important to make any benefit from this product. In the national projects of environmental pollution by uranium, health dangers and costs of treatments are some of the reasons leading to government intervention. If these costs are added to the net interest achieved from limiting pollution produced by radioactive elements that may cause diseases as cancer, this will lead to decrease in the total cost of the whole operation. As an example, if a man is exposed to a radioactive dose of 10 to 100 suivert annually, then 1 kg of uranium can affect about 10,000 people with cancer. The cost of chemotherapy of each patient ranges from 7000 to 20,000 LE according to the disease medication fees by the government. These data were declared in the conference held by the National Institute of Tumor on February 17th, 2014 under the title “Together against cancer.” From the tabulated results in [Table 5], it is clear that the income in the case of HNO3 treatment reached 375 LE, while in the case of HCl treatment it reached 234.8. It is concluded that husk treated by nitric acid gives higher economic efficiency in the recovery of uranium than that of hydrochloric treatment. A simple and cost effective treatment procedure was proposed for the removal of uranium through the adsorption on MRH. Adsorption is a good choice for uranium ions removal as it is operationally simple and can be adapted to change waste effluents’ flow rates and compositions. The solution pH has a significant effect on the removal efficiency, and the optimum pH is 3 for both HCl and HNO3 modifications. The Langmuir model adequately described the uranium adsorption data by both modifications with R2 value greater than 0.99, and this implies that the adsorption of the metal ions from their aqueous solutions proceeds by monolayer adsorption. Because this method involves less capital cost and is highly efficient, it is practicably feasible for developing countries. The results of the investigation will be useful for the removal of metals from industrial effluents. The authors would like to express their great thanks to professor. Doctor Nabil El-Hazek for his throughout revision. Chumee J, Grisdanurak N, Neramittagapong S, Wittayakun J. Characterization of AlMCM-41 synthesized with rice husk silica and utilization as supports for platinum iron catalysts. Braz J Chem Eng 2009;26:367-73. Srivastava VC, Mall ID, Mishra IM. Characterization of mesoporous rice husk ash (RHA) and adsorption kinetics of metal ions from aqueous solution onto RHA. J Hazard Mater 2006;134:257-67. Naiya TK, Bhattacharya AK, Mandal S, Das SK. The sorption of lead(II) ions on rice husk ash. J Hazard Mater 2009; 163:1254-64. Krishnani KK, Meng X, Christodoulatos C, Boddu VM. Biosorption mechanism of nine different heavy metals onto biomatrix from rice husk. J Hazard Mater 2008;153:1222-34. Tarley CR, Arruda MA. Biosorption of heavy metals using rice milling by-products. Characterisation and application for removal of metals from aqueous effluents. Chemosphere 2004;54:987–95. Ye H, Zhu Q, Du D. Adsorptive removal of Cd(II) from aqueous solution using natural and modified rice husk. Bioresour Technol 2010;101:5175-9. Bhatnagar A, Sillanpää M. Utilization of agroindustrial and municipal waste as potential adsorbents for water treatment − A review. Chem Eng J 2010;157:277-96. Ahmaruzzaman M. A review on the utilization of fly ash. Prog Energy Combust Sci 2010;36:327-63. Vieira MG, Almeida Neto AF, Silva MG, Carneiro CN, Melo Filho AA. Influence of the system on adsorption of Pb(II) and Cu(II) by rice husks ash: Kinetic study. Chem Eng Trans 2011;24:1213-8. Kumar PS, Gayathri R. Adsorption of Pb2+ ions from aqueous solutions onto Bael Tree leaf powder: Isotherms, kinetics and thermodynamics study. J Eng Sci Technol 2009;4:381-99. Giraldo L, Moreno-Piraján JC. Pb2+ adsorption from aqueous solutions on activated carbons obtained from lignocellulosic residues. Braz J Chem Eng 2008;25:143-51. Vieira MG, Neto AF, Gimenes ML, da Silva MG. Sorption kinetics and equilibrium for the removal of nickel ions from aqueous phase on calcined Bofe bentonite clay. J Hazard Mater 2010;177:362-71. Jiang MQ, Wang QP, Jin XY, Chen ZL. Removal of Pb(II) from aqueous solution using modified and unmodified kaolinite clay. J Hazard Mater 2009;170:332-9. Gupta VK, Ali I. Removal of lead and chromium from wastewater using bagasse fly ash − A sugar industry waste. J Colloid Interface Sci 2004;271:321-8. Farooq U, Kozinski JA, Khan MA, Athar M. Biosorption of heavy metal ions using wheat based biosorbents − A review of the recent literature. Bioresour Technol 2010;101:5043-53. Garg UK, Kaur MP, Garg VK, Sud D. Removal of nickel(II) from aqueous solution by adsorption on agricultural waste biomass using a response surface methodological approach. Bioresour Technol 2008;99:1325-31. Kalderis D, Bethanis S, Paraskeva P, Diamadopoulos E. Production of activated carbon from bagasse and rice husk by a single-stage chemical activation method at low retention times. Bioresour Technol 2008;99:6809-16. Sud D, Mahajan G, Kaur MP. Agricultural waste material as potential adsorbent for sequestering heavy metal ions from aqueous solutions − A review. Bioresour Technol 2008;99:6017-27. Kadirvelu K, Namasivayam C. Activated carbon from coconut coirpith as metal adsorbent: Adsorption of Cd(II) from aqueous solution. Adv Environ Res 2003;7:471-8. Marczenko Z. Spectrophotometric Determination of Elements. New York: Ellis Horwood Ltd., Halsted Press; 1976. p. 580. Li W, Zhang L, Peng J, Li N, Zhang S, Guo S. Tobacco stems as a low cost adsorbent for the removal of Pb(II) from wastewater: Equilibrium and kinetic studies. Ind Crops Prod 2008;28:294-302. Guibal E, McCarrick P, Tobin JM. Comparison of the sorption of anionic dyes on activated carbon and chitosan derivatives from dilute solutions. Sep Sci Technol 2003;38:3049-73. Lagergren S. About the theory of so called adsorption of soluble substances. Ksver Veterskapsakad Handl 1898;24:1-6. Ho YS, McKay G. Pseudo-second order model for sorption processes. Process Biochem 1999;34:451-65. Djeribi R, Hamdauoui O. Sorption of copper(II) from aqueous solutions by cedar sawdust and crushed brick. Desalination 2008;225:95-112. Ho YS, Mckay G. A comparison of chemisorption kinetic models applied to pollutant removal on various sorbents. Trans Inst Chem Eng 1998;76B:332-40. Kütahyalı C, Eral M. Sorption studies of uranium and thorium on activated carbon prepared from olive stones: Kinetic and thermodynamic aspects. J Nucl Mater 2010;396:251-6. Lee SM, Davis AP. Removal of Cu(II) and Cd(II) from aqueous solution by seafood processing waste sludge. Water Res 2001;35:534-40. Acar FN, Eren Z. Removal of Cu(II) ions by activated poplar sawdust (Samsun clone) from aqueous solutions. J Hazard Mater 2006;137:909-14. Bhattacharya AK, Mandal SN, Das SK. Adsorption of Zn(II) from aqueous solution by using different adsorbents. Chem Eng J 2006;123:43-51. Langmuir I. The adsorption of gases on plane surfaces of glass, mica and platinum. J Am Chem Soc 1918;40:1361-403. Freundlich HM. 1906. Über die adsorption in lösungen. Z Phys Chem 1906;57A:385-470.